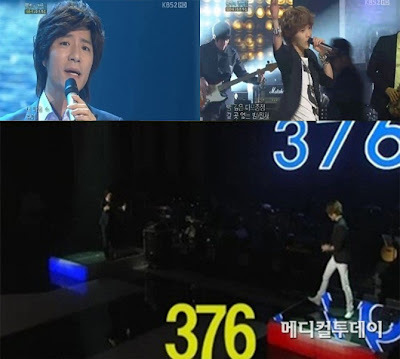 It is a first since “Immortal Song 2” broadcast to have a tie among the participants. Musical Actor Im Taekyung and SHINee Taemin have both garnered 376 votes with their individualistic performances for KBS2 “Immortal Song 2” broadcast. To pay tribute Park Chun Seok for his 2 year anniversary since his death, a special episode was broadcasted. On that day, the first performer was Im Taekyung. He chose An Dasong’s “Seaside” and gave an explosive and clear vocal performance, which have drawed all the audience’s attention on him. The following (performer) was SHINee’s Taemin. He performed “Silver Bell Sister’s” Mapo Terminal. He presented the song in a totally different style from the original song, which gave added spice and colour to his performance. It was quite an outstanding performance. After both performances, the commentator Kang Hon noted that “I hear Park Chun Sok’s voice and saw his music, at the same time being able to enjoy it”. He also praised ” Im Taekyung is good at keeping the original Western-feel on the stage, while Taemin added glamour to the originally humble tune and have presented a charismatic performance. It is by far the most spectacular performance he have seen on Immortal Song 2. Closely after the judge’s comments, the two received 376 votes , which holds the record of having a tie. This result has surprised both Taemin and Im Taekyung which caused they have hugged in gratitude. In addition to Im Taekyung and Taemin’s performance, Kang Minkyung, Park Jaebom, No Brain etc have also gave great performances and received recognition and applause from the audience.